The valley was flat! We weren't used to that - but it sure was fun to zip through the local farmland as we headed out toward the foothills of the Coast Range. Pedaling onward through the forests we came to Triangle Lake and lunch. What a view! A few of the hardier souls checked out the water. 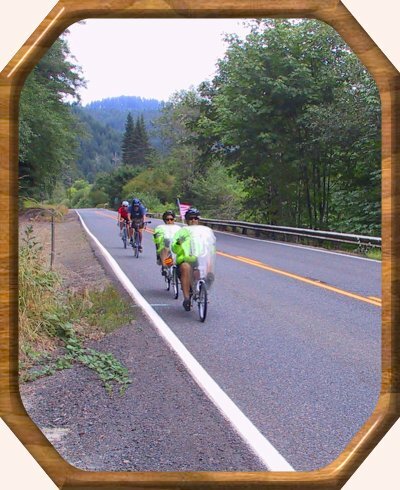 And then off through the hills again to Mapleton, where we joined the scenic Siuslaw River and followed it into Florence. And then another choice, should we go dip our wheels in the ocean? Or should we take the shortcut straight to the finish line? Either way it has been an incredible journey riding across this great state!